A 2017 Chevrolet Silverado 1500 for sale in Pauls Valley falls into that category of full-size truck - very popular these days because of the ability to do so many things and help us with our busy lives. For instance, they can haul construction materials or pull a trailer up the hill. The crew cabs can even offer a luxurious feel for the driver and the passengers, making them comfortable and offering a lot of back seat leg room. In 2017, the Silverado will offer you many different options to give you a nicer driving experience. The latest incarnation of the Silverado differs from its rivals in a few ways. There is a Teen Driver system that means you can set boundaries and be notified if they are breached by a younger driver. A parent will be very grateful for this option. However, anyone who parks with a valet in a garage will also be happy to have this feature. Grille shutters open and close to make sure fuel is conserved. There is an Enhanced Driver Alert package that comes with emergency braking at low speeds and a Premium package that comes standard on the high-end High Country level. The Chevrolet Silverado is likely to increase its market share in 2017, with many 2017 Chevrolet Silverados for sale in Pauls Valley and near Oklahoma City, OK.
You can choose from three separate styles when looking at the Chevy Silverado full-sized pickup truck for 2017. Three people can travel in its regular cab, and you can get either a bed of 8 feet or a bed of 6.5 feet. The longer cab can fit in six people and only comes with the standard bed. The crew cab comes with the standard bed or you can get a smaller bed of 5 feet 8 inches. Any of these cargo and cab combos can be purchased with either two-wheel drive or four-wheel drive. You can only get a regular cab on the LS, the LT, or the Work Truck trims. You can order the extended cabs in the WT, the Custom, the LT, the LS, and the LTZ trims. The crew cabs come with every trim level except the Silverado Custom. You can create the Z71 setup in the LT or the LTZ if you get the four-wheel drive to accompany it. The 2017 Chevrolet Silverado 1500 is offered in several trim levels: the WT, LS, LT, LTZ, and High Country. The standard WT is equipped with grille shutters, a comfortable 40/20/40 split for the front bench seat, a 4.2-inch color audio setup, vinyl seating, driver info display, tinted glass, air conditioning, a bed light, 17-inch wheels, power doors, adjustable mirrors, USB ports, and vinyl floor covering. While crew cab models have a rear bench that is a 60/40 split-fold, the extended cab model’s rear bench is full-width. Both crew and cab come with an audio system consisting of six speakers, as well as power windows, compared to the regular cabs that have manual windows and four-speaker audio systems. Compared to the 2016 model, the new 2017 has a reconfigured information and entertainment system, highlighting the 7-inch touchscreen display, OnStar access, Bluetooth, voice-controlled six-speaker sound system, the MyLink setup, and smartphone controls with Android Auto and Apple CarPlay. For the LS, expect chrome bumpers, tinted glass, heated power mirrors, enhanced entertainment display, and stainless steel wheels. It is further customizable with 20-inch alloy wheels, front tow hooks, and a special exterior trim. The LT model upgrades the LS with audio controls on the leather steering wheel, alloy wheels, 8-inch touchscreen display, an EZ lift and lower tailgate, enhancements to the driver display, a CD player, satellite radio, and a rearview camera. A floor-mounted wireless phone charging station is available and front bucket seats come in the double and crew cab styles. One further upgrade is the LTZ, which has a much larger V8 engine at 5.3 liters, front tow hooks, a 110V power outlet, power mirrors, a security system, remote start engine, 18-inch alloy wheels, driver memory settings, LED headlights, a trailer hitch, and more. The highest class of the 2017 Chevrolet Silverado, the High Country, has enough options to please any driver. It features 20-inch chrome wheels, a heated steering wheel, a unique grille, power adjustable pedals, ventilated front bucket seats, a seven-speaker audio system by Bose, wireless phone charging, a navigation system, and an Enhanced Driver Alert package. The 2017 Silverado by Chevrolet is again a leader in its class. 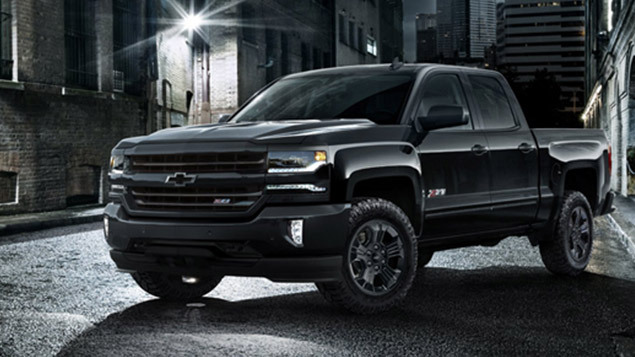 With the Z71 option available as a package on the LTZ and LT models, both with four-wheel drive, Chevy lovers can expect the same great things they have come to love from the Silverado. With sleek and tough looking body styling, 18-inch wheels with specialized shock absorbers and specialized controls for descending steep grades, the Silverado 1500 Z71 once again meets and exceeds all expectations. The great thing about the 2017 Chevy Silverado 1500 is the ability to customize your very own vehicle instead of being stuck between the traditional options. Lower end models can always add specific features that drivers can pick and choose from, making their 1500 truly unique. Whether you want to go with taller wheels and tires, powered mirrors, heated seats or even a tougher towing package, it is all an option for any model of the Silverado 1500. Of course, add options and you add cost, but it allows for you to get exactly the truck you want at a price you can afford. If you choose to go with the High Country model, you will enjoy the Enhanced Driver Alert System as a standard part of the trim option. The EDA is also available as an upgrade option on the LTZ and LT models, as well. The EDA gives drivers peace of mind by adding safety features that are both state of the art and proven to reduce accidents. The options that are available all depend on your base starting package and include everything from safety features to performance upgrades. There is truly no limit to the things you can add. While there are only a few styling and design options to choose from, they are some of the sleekest and best looking for a truck in this class. A truck custom made just for you is within reach in the 2017 Chevy Silverado 1500. Most Chevy Silverado 1500s are equipped with a 4.3-liter V6 engine that puts out 285 horsepower and 305 pound-feet of torque. It’s matched with a six-speed automatic transmission and either four- or rear-wheel drive. The approximate mileage per gallon is 24 for highway and 18 for city (for the rear-wheel drive model). Four-wheel drive brings it down to 22 and 17, respectively. The slight dip in fuel efficiency doesn’t change the fact that the Silverado is fast, agile, and fun to drive. The 2WD Regular Cab (including the Work Truck Trim) can reach sixty in 7.7 seconds. The LTZ and the High Country have a 5.3-liter V8 engine. It packs 355 horsepower and 383 pound-feet of torque. An eight-speed automatic transmission is optional. If you combine this with rear-wheel drive, you should be able to crank out 23 miles per gallon on the highway and 16 in the city. Four-wheel drive still offers 22 highway and 16 city. If you’re looking for even more power, the 6.2-liter V8 should fit the bill. It produces an impressive 420 horsepower and 460 pound-feet of torque. This produces an even quicker vehicle—the 4WD LTZ Z71 gets from zero to sixty in less than six seconds, an amazing feat. As far as towing goes, all models make a good showing. The V6 can handle up to 7,600 pounds, depending on cab and bed configuration. The 1500 with the 5.3-liter V8 can tow 11,000 pounds when equipped with the Max Trailering package, and the 6.2-liter with the same package can pull 12,500 pounds. The V6 boasts a payload of just south of a ton, the 5.3-liter V8 can carry 2,430, and the 6.2-liter maxes out at 2,160. Those numbers are based on the incorporation of the Max Trailering package but are still imposing figures. When you look at the Chevrolet Silverado 1500 for 2017 from the front, you see the masculine outlines of this vehicle. Its inspiration comes from Chevrolet’s heavy-duty line that echoes the big rigs of the old days. It gives the appearance of aggression and gets even more definition with available special edition trims. Even with that considered, we have to say that this current Silverado has greater aerodynamic properties than any of its other incarnations. It has grille shutters that open and close to allow better fuel economy as airflow passes smoothly over the front of the vehicle. The inside of this vehicle has a fresh feeling to it. The interior was kept simple by GM. It boasts an easy to use upright instrument panel that functions to the driver’s left, along with a big upright console system. Everything here is easy to read and to use even when wearing thick gloves. The settings can be changed quickly without needing to take too much time with the controls since lots of the places to be touched are made of soft rubber. The 2017 Silverado 1500 is a true workhorse that offers drivers power, power, and even more power. It has a massive amount of towing capacity, making it a tough truck but it is also elegant and stylish enough to serve as your mobile office. With enough room to pack in people and cargo, the Chevy Silverado 1500 is a leader in its class. With several cab configuration options, the 2017 Silverado 1500 can be whatever you need it to be. For the maximum room, there is the 4-door extended cab, then a 4-door regular cab and of course, the 2-door regular cab options available. Four full grown adults sit comfortably in the crew cab configurations, making them the most popular option. The extended cab model does have reverse swinging doors, but it causes a loss of almost 3 feet, which is noticeable. The 2017 Chevy Silverado 1500 has a luxurious yet rugged interior that will suit the needs of anyone needing the toughness of a truck and the style that only Chevy can deliver. Whether you need the truck for work and go with the tough vinyl or if you are leaning more towards style and choose the leather interior, the Chevy Silverado 1500 has you covered. The steering wheel will move where you need it to while staying warm in cold weather. With automatic features in the seats, mirrors and a state of the art infotainment system, the 2017 Chevrolet Silverado 1500 is the choice for truck enthusiasts everywhere. While the 2017 Chevrolet Silverado 1500 for sale in Pauls Valley near Oklahoma City, OK features tried-and-true safety features, such as anti-lock disc brakes, traction, stability control, plus front and rear seat airbags, it also gives parents an extra incentive to buy. Standard on all trim levels is the Teen Driver feature, which sets parameters for secondary drivers like teens and valets. When it comes to the all-important OnStar system, the Work Truck is the only Silverado model without it. Future owners can feel at ease knowing that the Silverado earned a perfect five-star rating in government crash testing stage. Also earning a perfect score was both its front and side impact protection, while its rollover protection earned slightly less with four stars.